boundary points in each rectangle and ellipses. REE setup represents both local and global views of the image outline. bound for length of moving line. which is different than EER which was defined in . each step are used for corner selection. with or without no ise. the design of the proposed corner detection algorithm. nally concluded in Section 5. Figure 1. Geometrical structure of NEW Algorithm. sidered to be the lengths 2A and 2B respectively. pi) on both sides of pi. rectangle R is adjusted along major axes of the Ellipses. Figure 2. Snapshot of NEW Algorithm. lute positions of corner point s.
methodology by combining three levels of views. ures 3(c) and 3(d) are only be considered in group G.
does not exist in that group. set G. Corners are marked in grey. solute position of corner points for standard shapes. solute position of corners [15,16]. Figure 5. Algorithm for proposed corner detector. Figure 6. Result comparisons for each corner detector. Figure 7. Test shapes with actual corner points . Figure 8. Corner detection by NEW Algorithm. Figure 9. Corner detection by AS Algorithm . Figure 10. Corner detection by FD algorithm . Figure 11. Corner detection by BT algorithm . Figure 12. 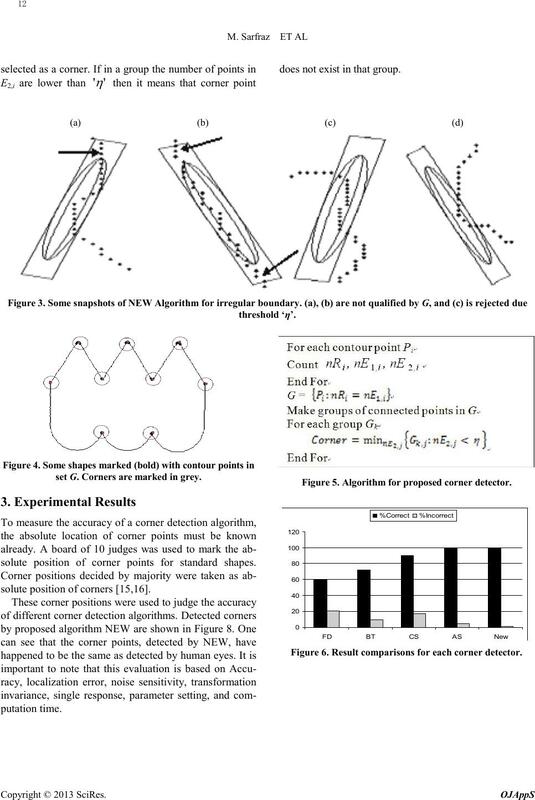 Corner detection by CS Algorithm . types of variations are probable in real time shape contour. posed algorithm is referred as NEW. and false detections which is 5%. Figure 13. 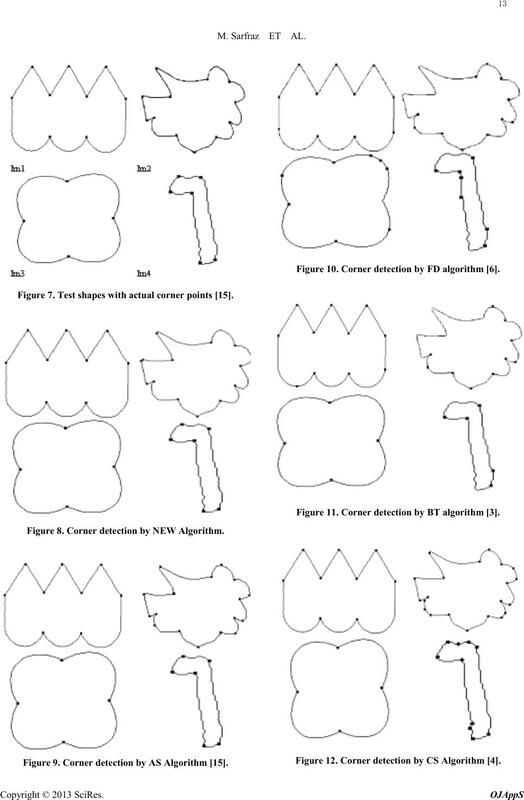 Corner detection by proposed Algorithm. Figure 14. 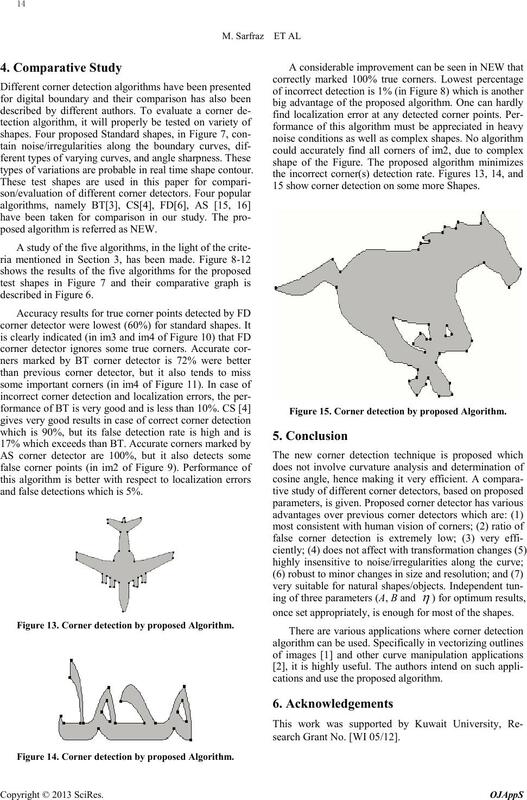 Corner detection by proposed Algorithm. 15 show corner detection on some more Shapes. Figure 15. 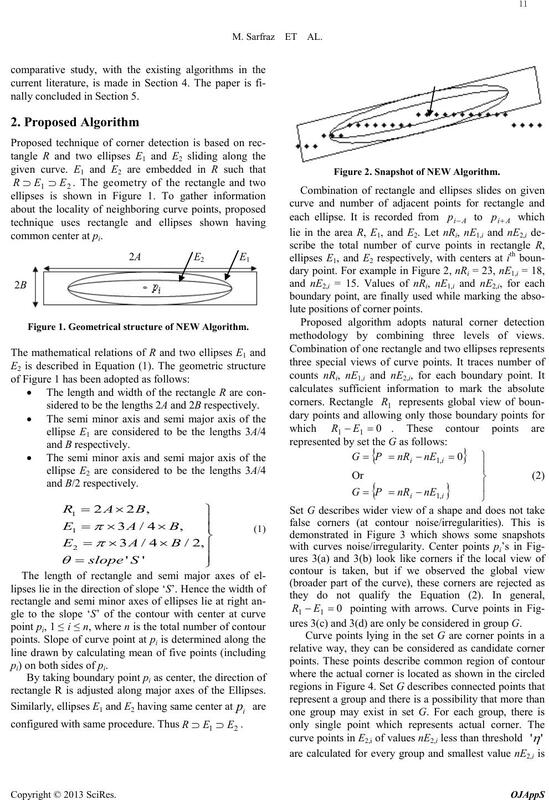 Corner detection by proposed Algorithm. once set appropriately, is enough for most of the shapes. cations and use the proposed algorithm. search Grant No. [WI 05/12]. 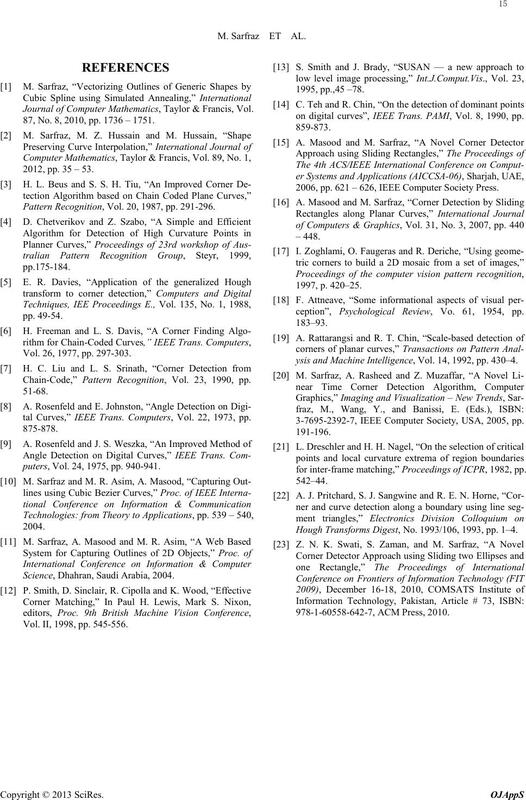 Journal of Computer Mathematics, Taylor & Francis, Vol. 87, No. 8, 2010, pp. 1736 – 1751. 2012, pp. 35 – 53. Pattern Recognition, Vol. 20, 1987, pp. 291-296. Vol. 26, 1977, pp. 297-303. Chain-Code,” Pattern Recognition, Vol. 23, 1990, pp. 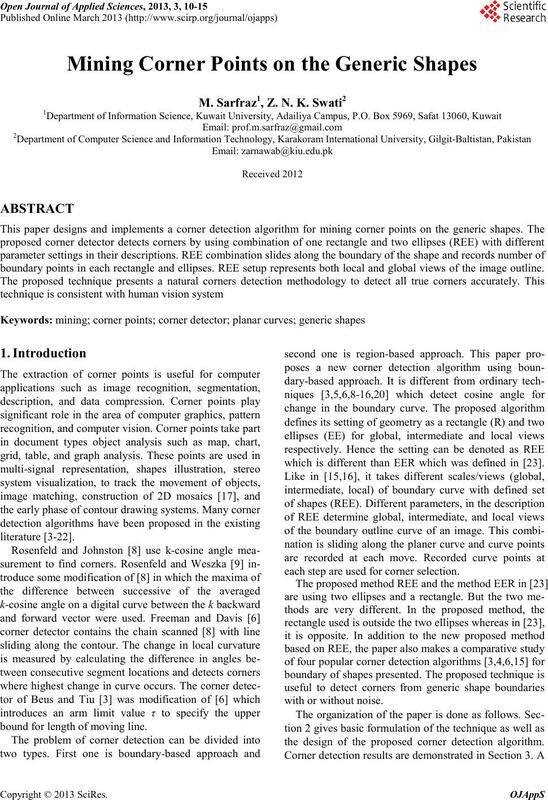 tal Curves,” IEEE Trans. Computers, Vol. 22, 1973, pp. puters, Vol. 24, 1975, pp. 940-941. Science, Dhahran, Saudi Arabia, 2004. Vol. II, 1998, pp. 545-556.
on digital curves”, IEEE Trans. PAMI, Vol. 8, 1990, pp. 2006, pp. 621 – 626, IEEE Computer Society Press. ception”, Psychological Review, Vo. 61, 1954, pp. ysis and Machine Intelligence, Vol. 14, 1992, pp. 430–4. 3-7695-2392-7, IEEE Computer Society, USA, 2005, pp. for inter-frame matching,” Proceedings of ICPR, 1982, pp. Hough Transforms Digest, No. 1993/106, 1993, pp. 1–4.